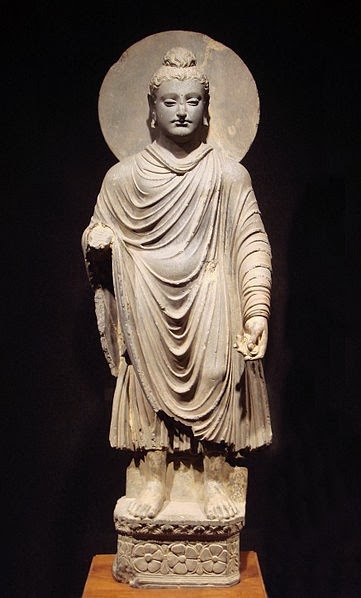 Siddhartha Gautama, who became the god Buddha, renounced the world and spent seven years in meditation. Then one day, while sitting under a fig tree, he became inspired with exalted and sublime conceptions of life and death. The rest of his life was spent in teaching and converting mankind. THE WORLD, for the most part, O Kaccāna, holds either to a belief in being or to a belief in non-being. But for one who in the light of the highest knowledge, O Kaccāna, considers how the world arises, belief in the non-being of the world passes away. And for one who in the light of the highest knowledge, O Kaccāna, considers how the world ceases, belief in the being of the world passes away. The world, O Kaccāna, is for the most part bound up in a seeking, attachment, and proclivity [for the groups], but a priest does not sympathize with this seeking and attachment, nor with the mental affirmation, proclivity, and prejudice which affirms an Ego. He does not doubt or question that it is only evil that springs into existence, and only evil that ceases from existence, and his conviction of this fact is dependent on no one besides himself. This, O Kaccāna, is what constitutes Right Belief. On birth depend old age and death, sorrow, lamentation, misery, grief, and despair. Thus does this entire aggregation of misery arise. On the cessation of birth cease old age and death, sorrow, lamentation, misery, grief, and despair. Thus does this entire aggregation of misery cease. On a certain occasion The Blessed One was dwelling at Sāvatthi in Jetavana monastery in An thapindika’s Park. And there The Blessed One addressed the priests. “Lord,” said the priests to The Blessed One in reply. “But on the complete fading out and cessation of ignorance, O priest, all these refuges, puppet-shows, resorts, and writhings,—to wit: What are old age and death? and what is it has old age and death? or, old age and death are one thing, but it is another thing which has old age and death; or, the soul and the body are identical, or the soul is one thing, and the body another,—all such refuges of whatever kind are abandoned, uprooted, pulled out of the ground like a palmyra-tree, and become non-existent and not liable to spring up again in the future. Inasmuch as it is dependently on each other and in unison and simultaneously that the factors which constitute dependence originate the elements of being, therefore did The Sage call these factors Dependent Origination. For the ignorance etc. which have been enumerated as constituting dependence, when they originate any of the elements of being, namely, karma and the rest, can only do so when dependent on each other and in case none of their number is lacking. Therefore it is dependently on each other and in unison and simultaneously that the factors which constitute dependence originate the elements of being, not by a part of their number nor by one succeeding the other. Accordingly The Sage, skilful in the art of discovering the signification of things, calls this dependence by the name of Dependent Origination. And in so doing, by the first of these two words is shown the falsity of such heresies as that of the persistence of existences, and by the second word, a rejection of such heresies as that existences cease to be, while by both together is shown the truth. By the first:— The word “Dependent,” as exhibiting a full complement of dependence and inasmuch as the elements of being are subject to that full complement of dependence, shows an avoidance of such heresies as that of the persistence of existences, the heresies, namely, of the persistence of existences, of uncaused existences, of existences due to an overruling power, of self-determining existences. For what have persistent existences, uncaused existences, etc., to do with a full complement of dependence? By the second word:— The word “Origination,” as exhibiting an origination of the elements of being and inasmuch as the elements of being originate by means of a full complement of dependence, shows a rejection of such heresies as that of the annihilation of existences, the heresies, namely, of the annihilation of existences, of nihilism, of the inefficacy of karma. For if the elements of being are continually originating by means of an antecedent dependence, whence can we have annihilation of existence, nihilism, and an inefficacy of karma? By both together:—By the complete phrase “Dependent Origination,” inasmuch as such and such elements of being come into existence by means of an unbroken series of their full complement of dependence, the truth, or middle course, is shown. This rejects the heresy that he who experiences the fruit of the deed is the same as the one who performed the deed, and also rejects the converse one that he who experiences the fruit of a deed is different from the one who performed the deed, and leaning not to either of these popular hypotheses, holds fast by nominalism. To give them here in full, however, meritorious karma consists of the eight meritorious thoughts which belong to the realm of sensual pleasure and show themselves in alms-giving, keeping the precepts, etc., and of the five meritorious thoughts which belong to the realm of form and show themselves in ecstatic meditation,—making thirteen thoughts; demeritorious karma consists of the twelve demeritorious thoughts which show themselves in the taking of life, etc. ; and karma leading to immovability consists of the four meritorious thoughts which belong to the realm of formlessness and show themselves in ecstatic meditation. Accordingly these three karmas consist of twenty-nine thoughts. As regards the other three, bodily karma consists of the thoughts of the body, vocal karma of the thoughts of the voice, mental karma of the thoughts of the mind. The object of this triplet is to show the avenues by which meritorious karma, etc., show themselves at the moment of the initiation of karma. Thus, when it is said that ignorance is the dependence of the karma-triplet consisting of meritorious karma, etc., it is to be understood that the other triplet is also included. But it may be asked, “How can we tell that these karmas are dependent on ignorance?” Because they exist when ignorance exists. For, when a person has not abandoned the want of knowledge concerning misery, etc., which is called ignorance, then by that want of knowledge concerning misery and concerning anteriority, etc., he seizes on the misery of the round of rebirth with the idea that it is happiness and hence begins to perform the threefold karma which is its cause; by that want of knowledge concerning the origin of misery and by being under the impression that thus happiness is secured, he begins to perform karma that ministers to desire, though such karma is really the cause of misery; and by that want of knowledge concerning cessation and the path and under the impression that some particular form of existence will prove to be the cessation of misery, although it really is not so, or that sacrifices, alarming the gods by the greatness of his austerities, and other like procedures are the way to cessation, although they are not such a way, he begins to perform the threefold karma. Moreover, through this non-abandonment of ignorance in respect of the Four Truths, he does not know the fruition of meritorious karma to be the misery it really is, seeing that it is completely over whelmed with the calamities, birth, old age, disease, death, etc. ; and so to obtain it he begins to perform meritorious karma in its three divisions of bodily, vocal, and mental karma, just as a man in love with a heavenly nymph will throw himself down a precipice. When he does not perceive that at the end of that meritorious fruition considered to be such happiness comes the agonizing misery of change and disappointment, he begins to perform the meritorious karma above described, just as a locust will fly into the flame of a lamp, or a man that is greedy after honey will lick the honey-smeared edge of a knife. When he fails to perceive the calamities due to sensual gratification and its fruition, and, being under the impression that sensuality is happiness, lives enthralled by his passions, he then begins to perform demeritorious karma through the three avenues, just as a child will play with filth, or one who wishes to die will eat poison. When he does not perceive the misery of the change that takes place in the constituents of being, even in the realm of formlessness, but has a perverse belief in persistence, etc., he begins to perform mental karma that leads to immovability, just as a man who has lost his way will go after a mirage. 1. Translated from the Anguttara-Nikya (iii. 331). THERE are three conditions, O priests, under which deeds are produced. And what are the three? Covetousness is a condition under which deeds are produced; hatred is a condition under which deeds are produced; infatuation is a condition under which deeds are produced. When a man’s deeds, O priests, are performed through covetousness, arise from covetousness, are occasioned by covetousness, originate in covetousness, wherever his personality may be, there those deeds ripen, and wherever they ripen, there he experiences the fruition of those deeds, be it in the present life, or in some subsequent one. When a man’s deeds, O priests, are performed through hatred, … are performed through infatuation, arise from infatuation, are occasioned by infatuation, originate in infatuation, wherever his personality may be, there those deeds ripen, and wherever they ripen, there he experiences the fruition of those deeds, be it in the present life, or in some subsequent one. It is like seed, O priests, that is uninjured, undecayed, unharmed by wind or heat, and is sound, and advantageously sown in a fertile field on well-prepared soil; if then rain falls in due season, then, O priests, will that seed attain to growth, increase, and development. In exactly the same way, O priests, when a man’s deeds are performed through covetousness, arise from covetousness, are occasioned by covetousness, originate in covetousness, wherever his personality may be, there those deeds ripen, and wherever they ripen, there he experiences the fruition of those deeds, be it in the present life, or in some subsequent one; when a man’s deeds are performed through hatred, … are performed through infatuation, arise from infatuation, are occasioned by infatuation, originate in infatuation, wherever his personality may be, there those deeds ripen, and wherever they ripen, there he experiences the fruition of those deeds, be it in the present life, or in some subsequent one. There are three conditions, O priests, under which deeds are produced. And what are the three? Freedom from covetousness is a condition under which deeds are produced; freedom from hatred is a condition under which deeds are produced; freedom from in fatuation is a condition under which deeds are produced. When a man’s deeds, O priests, are performed without covetousness, arise without covetousness, are occasioned without covetousness, originate without covetousness, then, inasmuch as covetousness is gone, those deeds are abandoned, uprooted, pulled out of the ground like a palmyra-tree, and become non-existent and not liable to spring up again in the future. When a man’s deeds, O priests, are performed without hatred, … are performed without infatuation, arise without infatuation, are occasioned without infatuation, originate without infatuation, then, inasmuch as infatuation is gone, those deeds are abandoned, uprooted, pulled out of the ground like a palmyra-tree, and become non-existent and not liable to spring up again in the future. It is like seed, O priests, that is uninjured, undecayed, unharmed by wind or heat, and is sound, and advantageously sown; if some one then burn it with fire and reduce it to soot, and having reduced it to soot were then to scatter it to the winds, or throw it into a swift-flowing river, then, O priests, will that seed be abandoned, uprooted, pulled out of the ground like a palmyra-tree, and become non-existent and not liable to spring up again in the future. In exactly the same way, O priests, when a man’s deeds are performed without covetousness, arise without covetousness, are occasioned without covetousness, originate without covetousness, then, inasmuch as covetousness is gone, those deeds are abandoned, uprooted, pulled out of the ground like a palmyra-tree, and become non-existent and not liable to spring up again in the future; when a man’s deeds are performed without hatred, … without infatuation, arise without infatuation, are occasioned without infatuation, originate without infatuation, then, inasmuch as infatuation is gone, those deeds are abandoned, uprooted, pulled out of the ground like a palmyratree, and become non-existent and not liable to spring up again in the future. The wise priest yields, but knowledge seeks. “We may have the case, O priests, of an individual who does some slight deed of wickedness which brings him to hell, or, again, O priests, we may have the case of another individual who does the same slight deed of wickedness, and expiates it in the present life, though it may be in a way which appears to him not slight but grievous. “What kind of individual, O priests, is he whose slight deed of wickedness brings him to hell?—Whenever, O priests, an individual is not proficient in the management of his body, is not proficient in the precepts, is not proficient in concentration, is not proficient in wisdom, and is limited and bounded, and abides in what is finite and evil: such an individual, O priests, is he whose slight deed of wickedness brings him to hell. “What kind of individual, O priests, is he who does the same slight deed of wickedness, and expiates it in the present life, though it may be in a way which appears to him not slight but grievous?—Whenever, O priests, an individual is proficient in the management of his body, is proficient in the precepts, is proficient in concentration, is proficient in wisdom, and is not limited, nor bounded, and abides in the universal: such an individual, O priests, is he who does the same slight deed of wickedness, and expiates it in the present life, though it may be in a way which appears to him not slight but grievous. “In exactly the same way, O priests, we may have the case of an individual who does some slight deed of wickedness which brings him to hell; or, again, O priests, we may have the case of another individual who does the same slight deed of wickedness, and expiates it in the present life, though it may be in a way which appears to him not slight but grievous. “We may have, O priests, the case of one who is cast into prison for a half-penny, for a penny, or for a hundred pence; or, again, O priests, we may have the case of one who is not cast into prison for a half-penny, for a penny, or for a hundred pence. “Who, O priests, is cast into prison for a half-penny, for a penny, or for a hundred pence? “Whenever, O priests, any one is poor, needy, and indigent: he, O priests, is cast into prison for a half-penny, for a penny, or for a hundred pence. “Who, O priests, is not cast into prison for a half-penny, for a penny, or for a hundred pence? “Whenever, O priests, any one is rich, wealthy, and affluent: he, O priests, is not cast into prison for a half-penny, for a penny, or for a hundred pence. “Just as, O priests, a butcher and killer of rams will smite one man if he steal a ram, and will bind him, and burn him, and wreak his pleasure on him; and another who steals a ram, he will not attack, nor bind him, nor burn him, nor wreak his pleasure on him. “Who is he, O priests, whom a butcher and killer of rams will smite if he steal a ram, and will bind him, and burn him, and wreak his pleasure on him? “Whenever, O priests, the robber is poor, needy, and indigent: him, O priests, a butcher and killer of rams will smite if he steal a ram, and will bind him, and burn him, and wreak his pleasure on him. “Who is he, O priests, whom a butcher and killer of rams will not smite if he steal a ram, nor bind him, nor burn him, nor wreak his pleasure on him? “In exactly the same way, O priests, we may have the case of an individual who does some slight deed of wickedness which brings him to hell; or again, O priests, we may have the case of another individual who does the same slight deed of wickedness, and expiates it in the present life, though it may be in a way which appears to him not slight but grievous.